I’ve been reading a lot of modern poetry recently, mostly Australian and American, and trying to work out why I find it difficult to be poetic myself. Reading poetry and writing about it are not writing it. Perhaps I’ve found the reason in a poem about poetry, written by Terry Gilmore. it is not the affected madness of a gymnast. broken loose from its heavenly connections. but this is nothing to me, it is of no use. to the objects of our love? I’m not too keen on madness myself. Which is, perhaps, why I’m not a poet. Matsuo Basho also comes to mind in a piece from a favourite book of poetry, Judith Wright’s Phantom dwelling (Sydney: Angus & Robertson, 1985). sent ghosts of wheatfields blowing over the sky. I bruise my knees on rocks which are new acquaintances. The daybreak moon is blurred in a gauze of dust. Long ago my mother’s face looked through a grey motor veil. Fallen leaves on the current scarcely move. But the azure kingfisher flashes upriver still. Poems written in age confuse the years. We all live, said Basho, in a phantom dwelling. 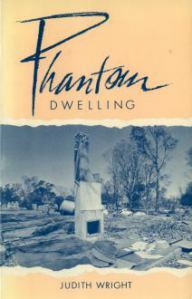 Wright’s reference is to a letter, The hut of the Phantom Dwelling (1690), by Basho, which he ended also with a thought on the difficulties of poetry and a haiku that seems to say that substance is more reassuring than thought. Again and again I think of the mistakes I’ve made in my clumsiness over the course of the years. There was a time when I envied those who had government offices or impressive domains, and on another occasion I considered entering the precincts of the Buddha and the teaching rooms of the patriarchs. Instead, I’ve worn out my body in journeys that are as aimless as the winds and clouds, and expended my feelings on flowers and birds. But somehow I’ve been able to make a living this way, and so in the end, unskilled and talentless as I am, I give myself wholly to this one concern, poetry. Bo Juyi worked so hard at it that he almost ruined his five vital organs, and Du Fu grew lean and emaciated because of it. As far as intelligence or the quality of our writings go, I can never compare to such men. And yet we all in the end live, do we not, in a phantom dwelling? But enough of that—I’m off to bed. Robert Haas (Poet Laureate Consultant in Poetry to the Library of Congress 1995-97) talked of Basho and the poet’s madness in interview with Grace Cavalieri The American Poetry Review, March 1997. Grace Cavalier: I guess this [reading of Haiku] moves us into the inevitable and that is your own attention to the thing itself which is the image. And I guess a couple of your themes. Critics talk of your ‘unswerving faith’ in the imagination and your belief in the image, in a thing. … I wonder if you would comment on that quality you have as a poet. I see the combination of the image and the imagination and I don’t quite know how to make that relationship. Robert Haas: Yes, you know in contemporary thinking about poetry, of course, it’s the big issue because if there is anything that defines post modernism I suppose it’s radical skepticism, skepticism about whether there’s a world we can know, with conceptual and ideological apparatus of the social worlds we’re born into. I think if there’s anything that characterizes contemporary art it’s skepticism about those things. Lots of writers, especially minority writers have been unpacking the extent to which the languages we acquire already marginalize them. Gays and lesbians have been—and thinkers sympathetic to the problems that come from this, whatever their own sexual orientation—have been thinking about the ways in which the very nature of language already marginalizes any sexual relationship that doesn’t look exactly like the ones that were approved by the churches in 1200. So there are millions of reasons to distrust the clear representation of the image and good reasons for distrusting them, and I think that one of the things that I love about haiku is that they work very hard to create the kind of aesthetic ideal. I guess you’d say, in which one could use language as a clear mirror of the seeing of the world which of course only happens through work. You don’t get to see that way if your head is full of brainless chatter.Yes, so that’s the connection.At some level the common world has to be earned over and over and over again. It doesn’t exist. Basho who would be—in the whole history of writing, the great example of this—when asked how you got to it he said through aesthetic madness. Which meant through imagination. There’s no way there without that but, the idea whether there is one or not, our language can model a kind of attention that seems to both call the world into being, and call us into being by being there… That’s an act of imagination. It’s not necessarily the way things are. In fact it’s not usually the way things are.